We don’t want to waste your time telling you how good we are we want to show you. We want to send a technician to your centre at a convenient time to complete an Obligation FREE demonstration clean*. We are so sure you will benefit in so many ways from a Sanitair clean and sanitise we would just love to show you how. So what about the hard sell after our FREE demo? 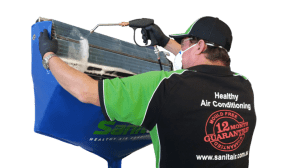 At Sanitair there is no hard sell. Our technician will leave you information and show you how a Sanitair Clean will end up costing you nothing. You contact us if you think our clean would be beneficial for you organisation. *Commercial customer offer minimum 6 systems to qualify.